Do you know the muffin woman? – Where Is My Teaspoon? Sunday again already – weekends really do go too fast. I’m in bed writing this, so cosy. I’ve just eaten my standard breakfast (almond butter, banana on toast with coffee) and am trying not to get out of bed again until 11. I always get up and start racing around but definitely think I need the time to rest today. On Friday night I drove down to Essex after work to see one of my best friends which was really nice. I always hate that I don’t get to see people very often but nights like Friday make up for it. I’ve got some chores to do around the house now today, my clothes are everywhere at the minute. Besides that the only plans for the day are gym and making a roast dinner with plenty of gravy. YUM! As I’m posting more regularly on the blog now, be sure to subscribe to emails (bottom of the page) and follow on Facebook, Twitter and Instagram too! If you like my blog, please share it with your friends too 🙂 If you’re a fellow blogger, post a link to yours in the comments and I’ll be sure to check it out! So at the beginning of the month, I mentioned I would be sharing a recipe for Savoury Muffins and I finally got the opportunity to make them last weekend when we went on our picnic. I’ll be sharing a post around my top tips for picnics later this week, but I always think the more variety of food you can have, the better! 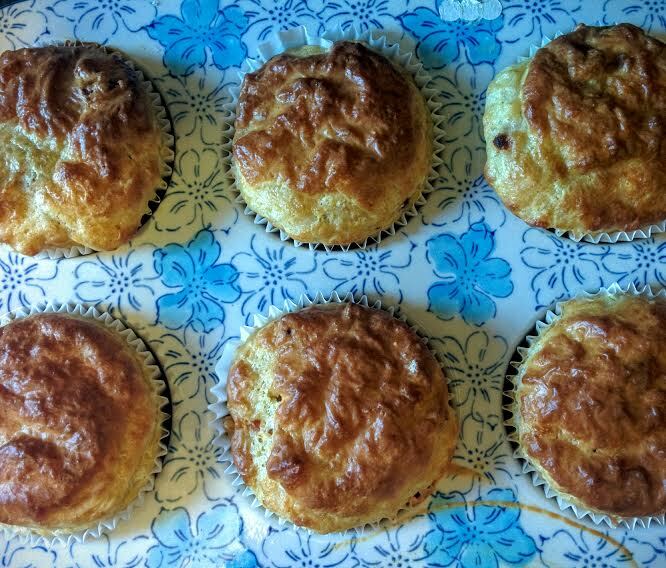 These Cheese and Bacon muffins are super simple to make in the mornings are make a great sugar free elevensies snack for work. This recipe makes 6 full sized muffins. Chop the rashers into small pieces using a kitchen scissors. Cook the rasher pieces in a pan on the hob until golden brown. Add the maple syrup and cook until all the bacon is coated and looks sticky. Weigh out your flour, smoked paprika and baking soda into a bowl. Mix together and add the rasher pieces. Move them about in the flour to ensure they all don’t stick together in one big bacon lump. Mix the egg and the milk together and add to the bowl with the rest of the ingredients. Work quickly and confidently now and bring everything together by folding in the mixture. Be careful not to beat it or else they will turn out tough rather than light and fluffy. When ready, spoon the mixture into a 6 hole muffin tray and bake for about 15 minutes until raised and golden brown. These are delicious warm straight from the oven – might be a good start to a Monday morning?